If we ask why it was that women weren’t demanding the vote in the seventeenth century, one of the answers is their own acceptance of [their] inferior status. Because they were sicklier, more at risk of dying, and generally more enervated by things like anemia than men, they accepted their subordination as part of the natural order. Little wonder it got 18 year-old me all fired up. The reason I have taken you on this jaunt down memory lane is that I could not help but be reminded of this favourite book when I started reading Wendy James’ OUT OF THE SILENCE. 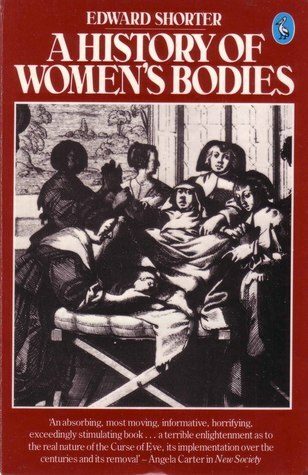 For, although it is ostensibly a novel about a crime, it is, at least for me, more a novel about how inhabiting a woman’s body has, for the vast bulk of history, been something considerably less than a barrel of laughs. The book was, reportedly, the only début novel published by Random House Australia in 2005 which, having now read it, I can at least conjecture was due to the fact that other submissions paled in comparison. Even if the reason for it being the publisher’s sole risky investment that year was more prosaic it was certainly a good choice, offering something for fans of history and mystery and having a good few facts – in the form of real people and events – interspersed with the fiction that James has created. It is the story of two women living in Victoria at the turn of the last century. Our country’s six separate colonies were still a year or so away from federating as the Commonwealth of Australia and only two of those six colonies allowed women to vote. At the outset of the story Maggie Heffernan is a teenager living in the country. She is happy enough with her lot, although the lack of any genuine affection from her mother puts a strain on her young shoulders, but becomes radiant when she falls in love with the nephew of one of her neighbours. Elizabeth Hamilton is a thirty(ish) English woman who has moved to the colony on her own, following a personal tragedy that has demanded she be more independent than she had ever thought she would need to be. She is engaged to be a governess for a local family but when that situation proves unsuitable she heads to Melbourne to stay with some cousins, one of whom ultimately provides the mechanism for the paths of these two women to cross. It wasn’t until that cousin, Vida Goldstein, cropped up that I realised this book was based on real-world events (I never read blurbs before reading the book and picked this one to read simply because I enjoyed James’ most recent novel and wondered what her first, which won the 2006 Ned Kelly Award for best first fiction, might be like). In the novel, as in real life, Goldstein was one of Australia’s leading campaigners for women’s suffrage and the general improvement of women’s lives which is how she became involved in the story of the real Maggie Heffernan who was convicted of a very real, and truly awful, crime. Elizabeth, who is an entirely fictional character, provides an interesting counter-balance to Maggie in terms of the roles women of different classes are expected (and themselves expect) to play in society as well as allowing the author to tease out some of the fictionalised details of the events which might have led to Maggie’s fate. Most reviews and discussions of the book provide a lot more detail than this but in case, like me, you want to come to the novel with fresh eyes, I shall say no more about the plot. Maggie’s story is told with a straight-forward, first-person narrative while Elizabeth’s unfolds via a mixture of extracts from her diary and letters to her journalist brother as he travels the world. There are also, towards the end, a few extracts from newspaper articles (I’m unsure if these are actual reproductions or a product of James’ imagination but it doesn’t matter – they add a nice detail either way). Differentiating the storytelling in this way helps the reader quickly and easily adjust to each switch from one woman’s narrative to the other’s as well as allowing the widest possible scope for the novel to have a personal aspect about the main characters and a wider, more public one about the role of women in the society being depicted. I thought the novel worked well on both levels and James achieved the right balance between these two elements. For example from what little I know of her I suspect an entire book devoted to good works of Vida Goldstein might make for somewhat…earnest… reading but her strategic placement at key parts of this story adds a necessary layer of social context and some fascinating glimpses into the local movement for women’s suffrage. The characters here are highly nuanced and do not always behave as the reader expects. Both of the two central women are presented with options that, if chosen, would have changed their ultimate fate. For Maggie in particular this would have been hugely significant and I really liked the way neither she nor the author took the easy route. Of course James was driven in part by the facts of the case but if she’d wanted to present a less thoughtful but perhaps more socially acceptable storyline for Maggie she could have neglected to create such forks in the road for her fictional version of the woman. As you can probably tell I thoroughly enjoyed OUT OF THE SILENCE. The historical detail provided via a mixture of fact and fiction, the thoughtful consideration of the roles women were given or, in some cases, made for themselves, at this time in history and the thoroughly engaging story are all equally strong elements to recommend the novel. And although it is not the classic whodunnit beloved of crime fiction fans, it is a very good example of the far more thought-provoking, and ultimately more satisfying whydunnit. I suppose it is fitting that I read this book as part of my participation in the Australian Women Writers Challenge as it embodies everything the challenge represents for me. Of course it’s a book written by an Australian woman but it is also a good example of the kind of under-recognition of great work that seems to happen to writing by Australian women. The fact that its subject matter is itself concerned with the role and place of women in an Australian society that isn’t so very long ago is a further element to recommend the novel to challenge participants looking to ponder this issue as part of their reading experience. 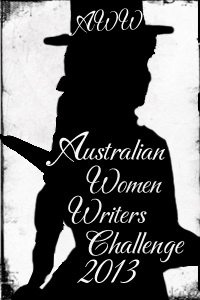 I decided that as part of my participation in this year’s Australian Women Writers Challenge I would highlight some older novels of the crime genre that are notable for some reason or other, having won an award or contributed to the genre’s development in some way. It’ll be an eclectic mix, largely based on what I can get hold of via my library but if you have any suggestions for books that might make good features please leave a comment. OUT OF THE SILENCE is the fourth book I’ve read for this year’s challenge. 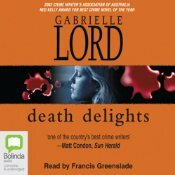 In 2002 Gabrielle Lord’s novel DEATH DELIGHTS won the Ned Kelly Award for best fiction. Although it was the sixth year the award had been given this was the first occasion a female writer was to receive it, an achievement that has only been repeated once since then with 2012’s PIG BOY by J.C. (Jane) Burke. Lord had been beavering away at the crime and thriller writing caper for at least 22 years by the time she won this award, having released her first standalone novel, FORTRESS, in 1980 and publishing a total of eight books prior to DEATH DELIGHTS. The novel is a procedural which introduces forensic scientist Jack McCain. Once a cop with the NSW police force Jack studied to become a scientist and now works for the Australian Federal Police based in Canberra. Though when the novel opens he is on leave and is back in Sydney. His old partner asks him to help out with an investigation into the deaths of two men who have been murdered in a particularly grizzly way. Jack (having a vastly different definition of ‘being on leave’ than I do) throws himself into the case. Jack has more than his fair share of personal troubles as well, several of which come to a head as DEATH DELIGHTS progresses. His teenage daughter Jacinta ran away from home 18 months earlier and Jack and his estranged wife Genevieve are out of leads on where to look for her when police receive and anonymous tip regarding her whereabouts. Jack immediately follows up, learning facts which have disturbing repercussions for his entire family. In addition Jack has never really given up wanting to know what happened to his little sister who also disappeared as a teenager; kidnapped from near their family home when she was 13, some 25 years earlier, and never having been seen alive since then. When it appears there is a connection between his sister’s disappearance and the case of the murdered men whose bodies have been mutilated Jack wonders if he will finally learn what happened to his sister. DEATH DELIGHTS is complex and suspenseful and while there is some gruesome violence it is not gratuitously dwelt on. Lord weaves together all the elements of Jack’s personal and professional lives with consummate skill and the reader is never left floundering for something interesting to look out for. I particularly like the way this novel combines the traditional investigative type of case, with interviews and surveillance and so on, with the scientific elements. Unlike episodes of CSI or some of the more formulaic novels I’ve read there’s no instant case solving by finding a particularly unlikely fingerprint but the science, always well explained, offers an added dimension to matters at hand. But the book has other layers too. It is almost like an adult coming of age story for Jack who has so many threads of his personal life to keep track of and so many past mistakes he feels the need to atone for. Lord has explored the notions of family and of how we learn to be good parents, siblings, partners and so on. The idea that this all comes naturally seems to be a given in society but through Jack, who is by no means a deadbeat, we see how hard it can be to take on these roles without a handy instruction manual. What was perhaps most realistic was that even when he knew what the correct behaviour or gesture should be Jack couldn’t always bring himself to give that hug or spend the necessary time with the person who needed him. In other words he was a very realistic human. DEATH DELIGHTS has something for every crime fiction fan containing procedural, forensic and cold case elements as well as a thoughtful family drama. It can easily hold its own against the more well known imported offerings in these genres, with the added bonus of a thoroughly Australian sensibility. A highly recommended novel that should be seen as a classic of the genre.